I know, hexies are só 2010 🙂 But ever since the hype started I have been wanting to give them a try anyway. So when I spotted these these hexie templates at the Handwerkbeurs last month I just had to buy them. I thought they were a bit pricey but since paper crafts really aren’t my sort of thing I got them anyway. 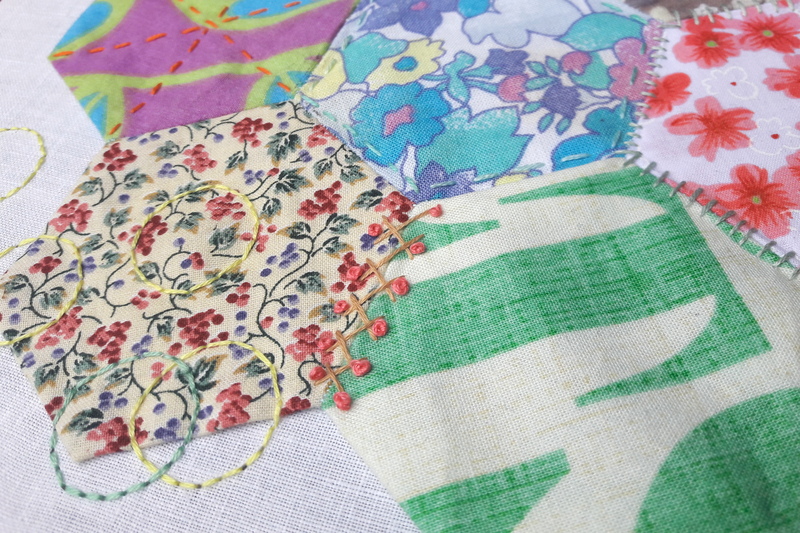 So the other day I got my box of fabric scraps out and made 7 hexies, just by picking out random scraps. They don’t match at all but that wasn’t the point: I just wanted to experiment with the technique. I assembled them like described in all the tutorials (I followed this one but left out the glue, but there are many others). And then what? So now I spend every lost hour (while cooking; before going to sleep etc.) embroidering it further. Even though technically it could be called crazy quilting I suppose. Or even art quilting? I don’t know; for me it’s just having fun with needle and thread and fabric. Just makes me happy! 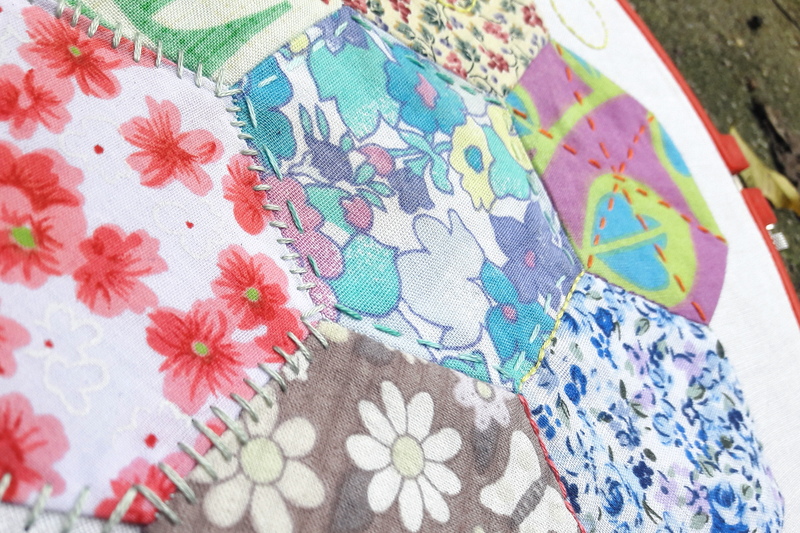 Check here for more embroidery posts and here for more patchwork projects. I absolutely love what you’ve created by adding the embroidery stitches! That is a lot of linky parties… wowzer! 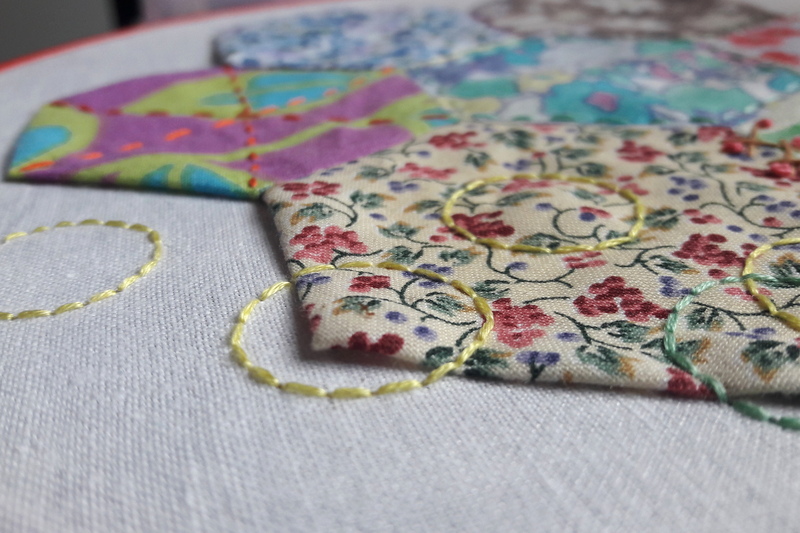 Lovely stitching on your hexies… how do you make such a perfect circle of stitches?? I’m sort of trying out all the linkies I can find… but I don’t think I will be posting to most of them a lot. Just trying to see which ones fit. As for the circles: I marked out a circle on the back of the fabric; in fact I used a pencil to trace around the larger side of my thimble. The stitching covers any traces of the pencil marks. I love what you have done with your hexies you have definitely made them your own! Thanks for linking up to New to Me too. The embroidery adds extra texture to your hexies! Very fun! Thanks, yes I thought so too. That’s what I like about embroidery the most, it can be so tactile. This piece is so charming and sweet. I love the stitches you have added. Thanks for sharing with Oh Scrap! You’re welcome! And thank you too! 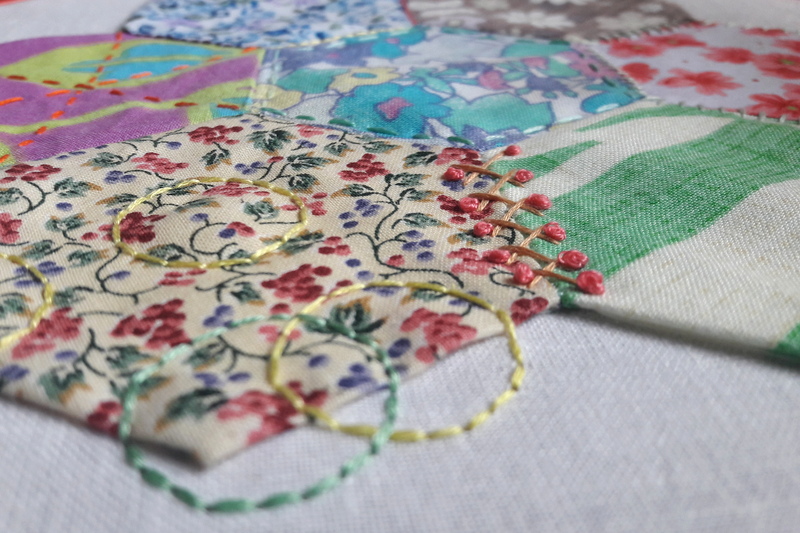 That’s a great way to play with hexies and embroidery – both of which I’m crazy about! Oh mu goodness, this is beautiful. 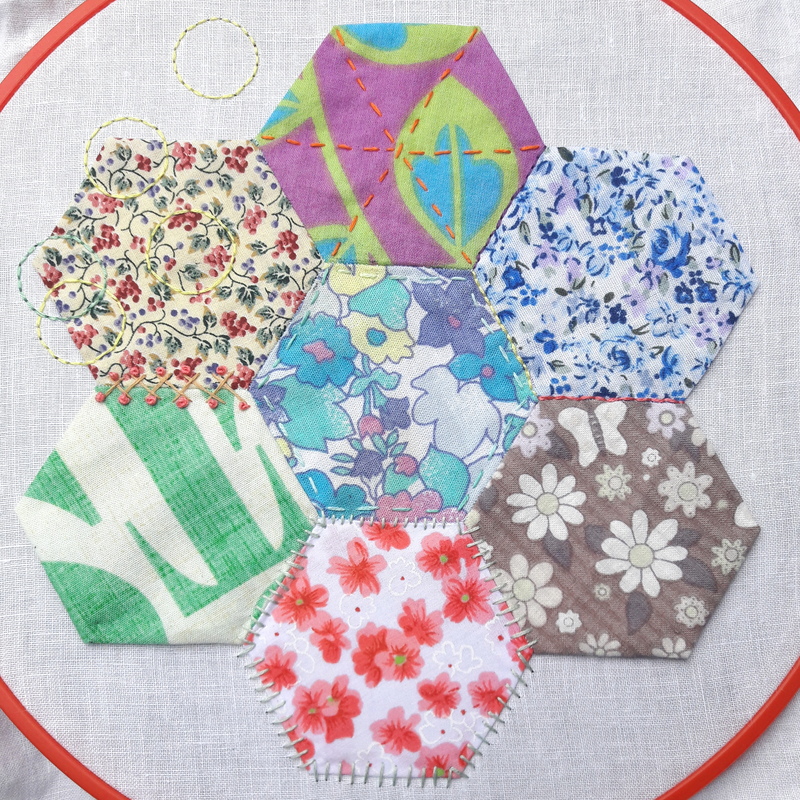 I made some hexies just the other week (hexies are forever!) then I just sewed them to fabric in a very boring, all round the edge way. I feel so silly now, this is SO much more lovely! And thanks for the wonderful feature too! Now how cool is that. I love the idea of embroidering around the hexies!! Thanks so much for linking up to this month’s Stitchery Link Party! Previous post Now Sinterklaas too!